Dacron sailcloth has two natural enemies—sunlight and chafe, both of which are found in abundance on the typical sailboat. 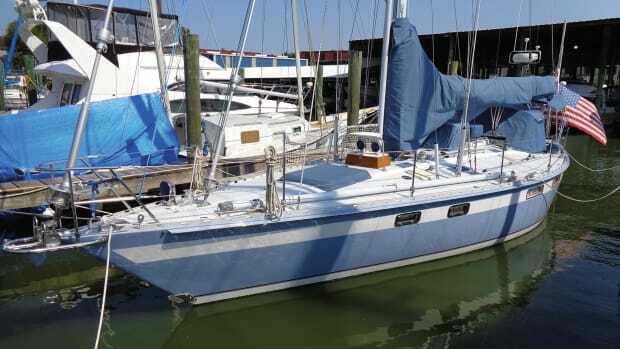 There is not much you can do to stave off damage from ultraviolet light except to keep the mainsail covered between excursions and make sure the sacrificial strip on the leech and foot of a furling genoa is in good shape. Chafe is another matter. Anything that stands proud of the sailcloth—such as stitching—is susceptible to wear as soon as it comes in contact with anything else, be it cloth, rope, wire or metal. Often, chafe goes largely unnoticed until the damage is done. 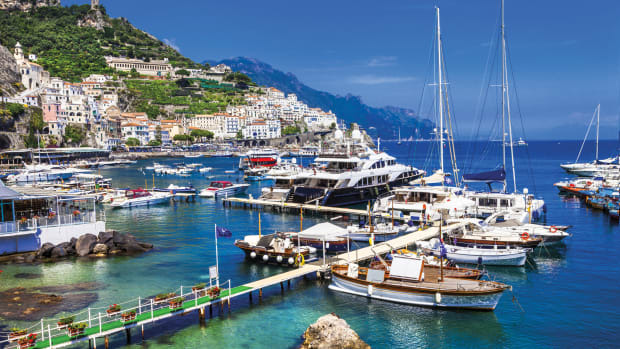 If you have your sails valeted each fall your sailmaker will have found and repaired any damage; if not, it’s easy enough to inspect your sails yourself. If possible, spread the sail out on a clean artificial surface—not on your lawn, as it’ll pick up dirt and grit—but if you’re on your boat, drop the mainsail out of its track and pull it over the boom bit by bit. Here’s what to look for. Broken or worn stitches: Even a few broken stitches can quickly become a great many broken stitches—and possibly a luff-to-leech tear. You shouldn’t be able to see daylight through any of the seams. 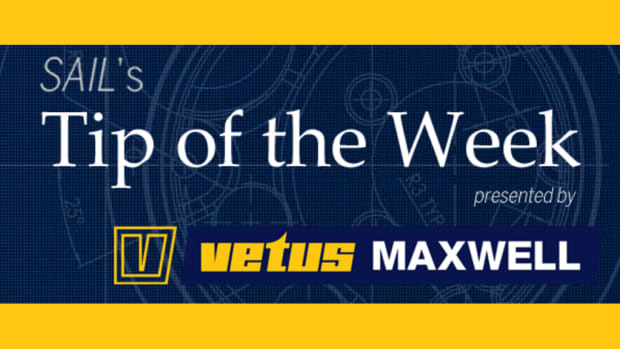 If you’re not much of a seamstress you can plead with your local loft to make the repair, but don’t count on them having the time to do it at the start of the season when most of them are extremely busy. Sailcloth: Check anything that regularly comes in contact with wire or metal or rope—reef patches, batten pockets, the foot of the genoa where it passes over the lifelines. 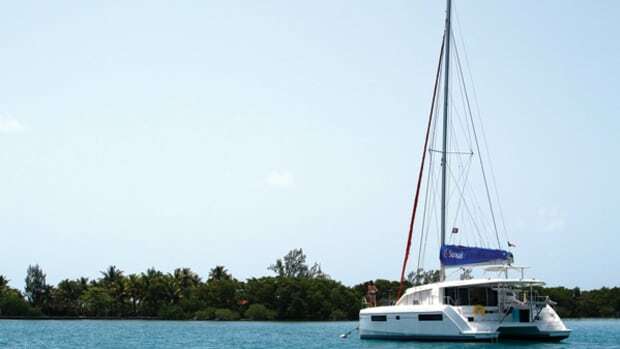 The mainsail is especially vulnerable, bearing as it does on the knifelike trailing edges of the spreaders when sailing downwind, and also on the shrouds. Hardware: Sail slides can come under a lot of strain, especially at the headboard and tack, and these fall into the taken-for-granted category. No one ever thinks of inspecting them closely. UV light can degrade the plastic, and the webbing attaching them to the sail can chafe through. Check the slides for wear and fractures; if you have high-end luff cars, rinse them out with freshwater and otherwise follow the manufacturer’s instructions for maintenance. Attachment points: Check the headboard for worn or corroded rivets and grommets. Also be sure to look over the clew and tack rings. These are strongly built and reinforced, but can suffer from general wear and tear. 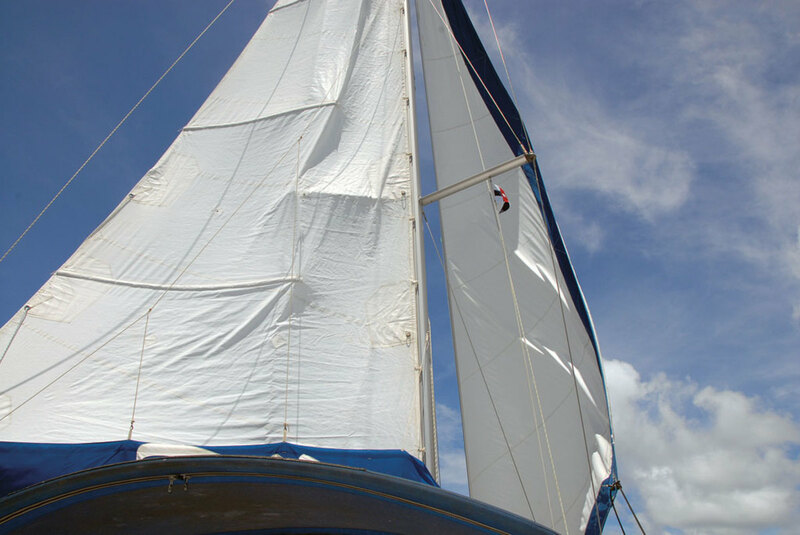 Because the mainsail often comes into contact with spreaders and shrouds, it is much more susceptible to chafe than the headsail. The sharp trailing edges of spreaders are the main culprits. 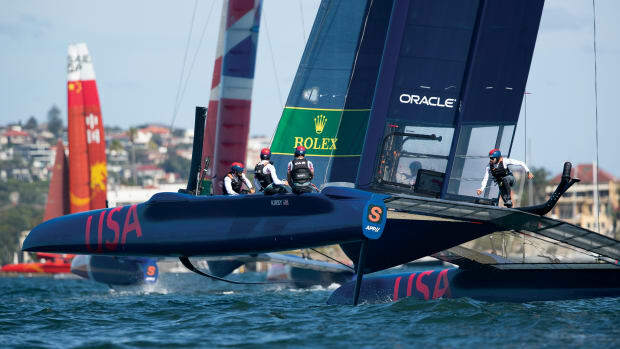 Such spreaders—a trickle-down from racing boats—may be aerodynamically efficient, but they are nothing but a nuisance on cruising boats where the slightly reduced drag makes not one iota of difference to performance. 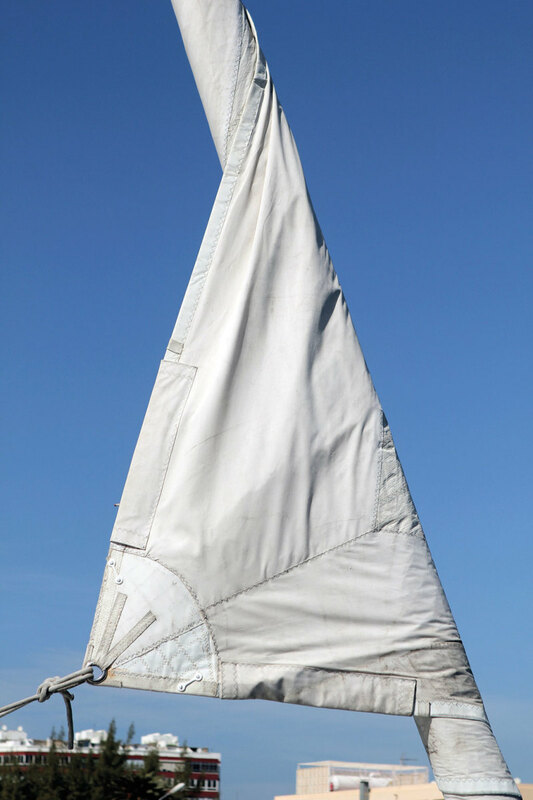 You can limit the damage with Dacron spreader patches—the black marks on the sailcloth or batten pockets where they contact the spreaders will show you where to place them—and also, when sailing deep angles, by vanging the sail down hard to limit its movement and by sheeting in till the main is just off the spreader. If your boat has aft-swept spreaders it won’t be possible to keep the sail off the spreaders when you’re reaching. The mainsail also typically bears on the cap and aft lower shrouds, and these will wear through a batten pocket in no time at all. Sticky-back Dacron patches on the wear points will be a short-term cure, but a better way is to have your sailmaker sew nylon webbing along the pockets. Dyform rigging wire, with its sharp edges, is especially hard on stitching and sailcloth, so it’s generally a good idea to install full-length plastic rollers on shrouds that come into contact with sails. Some bluewater cruisers install lengths of split garden hose on their shrouds while on passage and discard them at their destination. Another bluewater trick is to tape split foam pipe insulation over the aft edges of the spreaders before embarking on a tradewind passage. 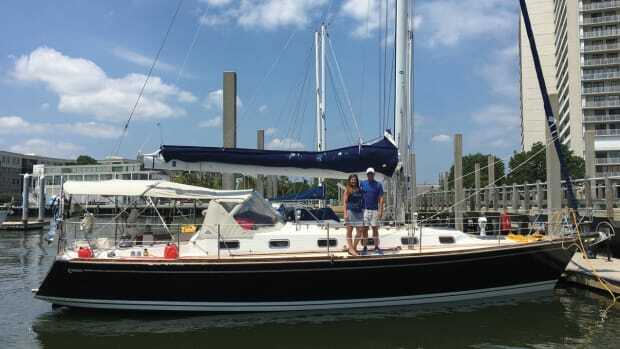 Plastic hose on the reefing lines where they pass over the folds of the reefed sail is another bluewater standby. And, of course, you can always resort to good old-fashioned baggywrinkle, if you want to give your boat a truly salty look. Other lines that can chafe a mainsail over the long term are lazyjacks and topping lifts, which tend to rub across the proud stitching on the seams. 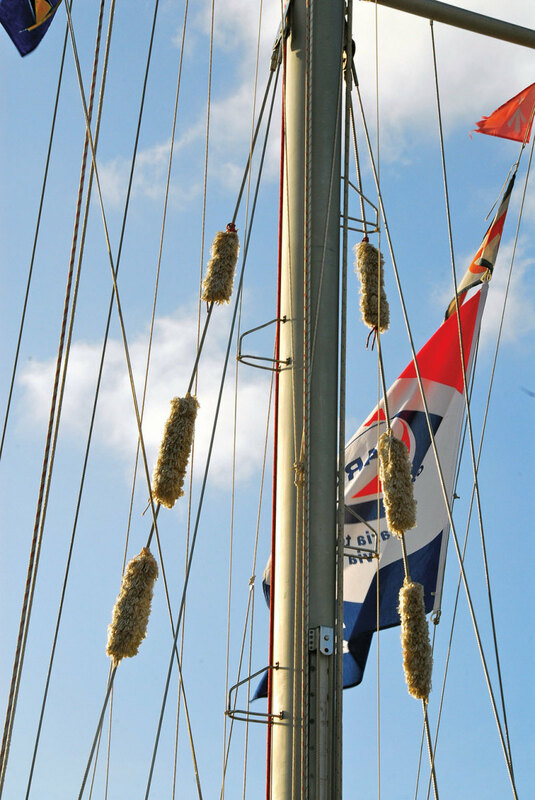 This can be largely avoided by rigging the lazyjacks so that they can be taken forward to the mast while under sail, and adjusting the topping lift so it doesn’t rub against the leech. If you have a rigid vang, the topping lift can be unclipped from the boom end and made fast on deck. As for the headsail, it suffers a little chafe each time it is tacked, as the cloth rubs across shrouds, lifelines and spreader tips. The leech and foot are most susceptible to damage, and should be checked regularly—drop the sail in mid-season, or before a long passage, to inspect the stitching along the sacrificial strip and leech tabling. 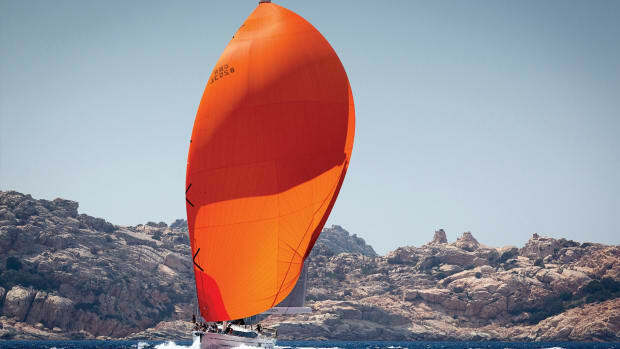 You can limit damage by making sure the sail has chafe patches where it bears against spreader tips and along its foot where it passes over the pulpit or lifelines. Plastic spreader caps are readily available, or you can make your own leather protectors. 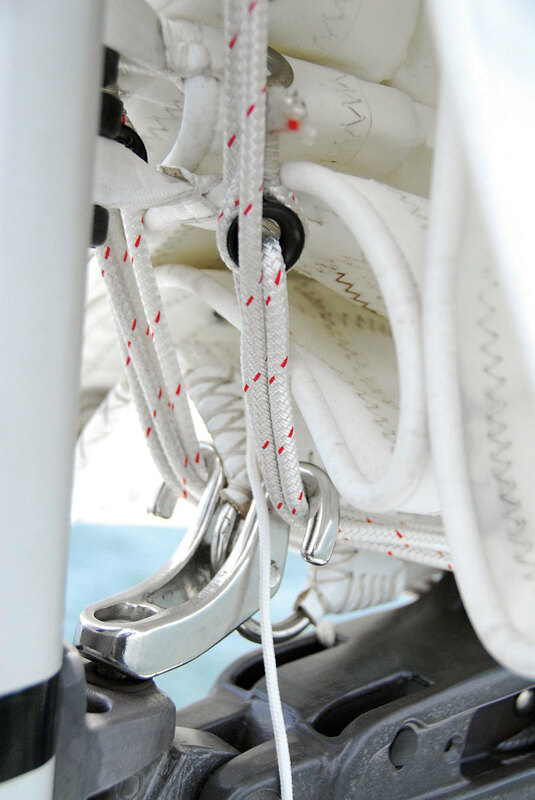 Tour the foredeck, tape over all split pins and rings and anything else that might snag or rip the sail, check your wire lifelines for broken strands, and completely cover your forward upper lifeline turnbuckles or connectors with tape. Make sure there are no sharp screw ends protruding from mast fittings. 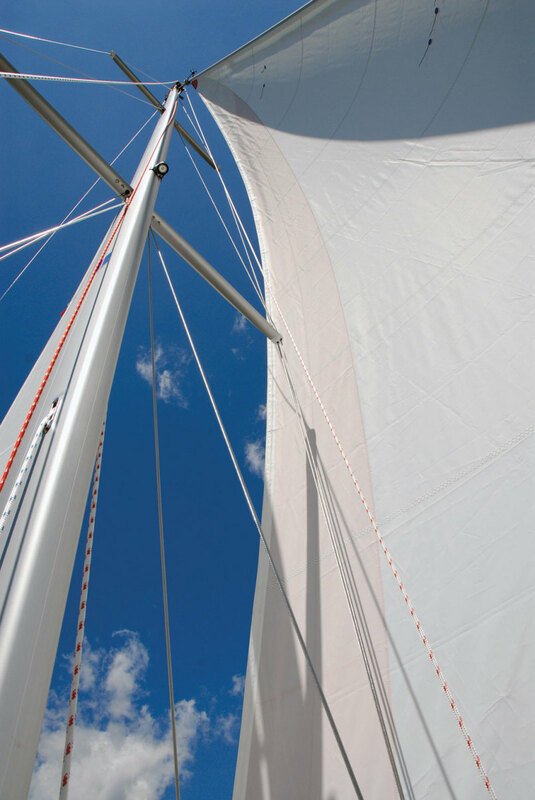 Downwind sails take up a lot of deck space when they’re being set or handed, so make sure rigging turnbuckles are taped or covered so protruding pins or bits of seizing wire can’t hook the sailcloth. In general, it’s a good idea to make sure your entire boat is snag-proof. I’m here to tell you that tearing an expensive pair of foulweather pants on a split pin that’s carelessly been left untaped can ruin your day—never mind the potential sail damage.  Since there is a North Sails loft just across the street from SAIL’s HQ in Salem, Massachusetts, we took the opportunity to get some advice from Brad White, a 35-year veteran of the sailmaking game who’s seen plenty of owner-inflicted horrors. “It doesn’t seem like a big deal, but removing salt and dirt from a sail will prolong the life of the fabric,” says White. “If there are rodents where the sail is stored, they will seek out the salt as if it were a salt lick. I’ve known rodents to burrow through many layers of a perfectly good sail. The sharp crystals in salt also can cause micro-cuts in the fabric, leading to premature breakdown. “Dirt is an abrasive and is best removed, but don’t try to aggressively scrub out dirt and stains, as this can damage the sail. It may be better to live with the stain. And never put your sail in a tumbling wash system. A good soak in a mild water and detergent solution is best and then rinse well until all the detergent smell is gone. “When you’re sailing, don’t let the leech flutter or ‘motorboat,’ as it weakens the sailcloth. Use your leechline to control leech flutter. Flogging is bad too, as it shakes out the resin that locks the yarns in place. Once these are gone the sail loses its shape.